This oil ($50 for 4 oz.) saved my skin from our parents’ “hard water” situation while visiting. The tap water where we were raised is tasty and safe – I love that! More than I can say for the good old coppery tasting tap water from the City of Angels…blech! But whenever I go back home, and especially in fall/winter, my skin takes a proverbial beating. I leave looking like a scaly Komodo dragon. I applied the body oil immediately after getting out of the shower, as you do, and was immediately pleased by the scent – floral and stronger than the body wash. The rich avocado and other oils slick on and absorbed into my cracked and, frankly, depressed skin. I slipped into a better mood immediately and reminded myself that I must be proactive about my skin while in a hard water situation - really baby it, and make sure I follow up with the oil everyday. I followed that rule for two weeks, and still have half a bottle of the TRAVEL size oil left. I decided to leave it at my parent’s house for the next time I visit (in winter) to be reminded of the smells of summer, that my skin doesn’t have to be gross when I travel, and that even in the country, this city girl can enjoy and indulge in spa-like products that really do work. Now, if I can just teach myself to pack a PB & J for the plane ride back instead of stock piling those free salty snacks on Jet Blue, I will have really turned a corner. I usually cringe when I see alcohol listed as an ingredient toward the top of the list on lotions: I worry the product will be drying. But I’m glad that didn’t deter me from trying out this lotion ($40 for 8 oz.). 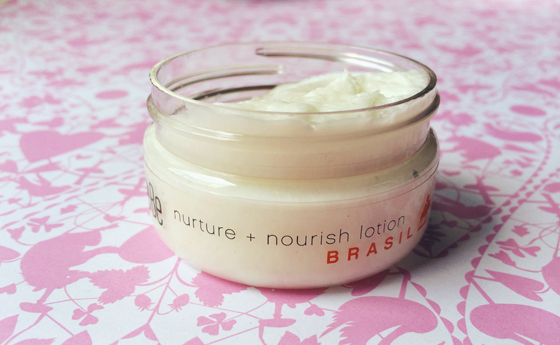 It’s a thick, rich, moisturizing lotion that I’ve found to be super nourishing for extra dry skin. It has a silky feel and melts right into the skin with a LOT of natural oils going to work for you – a number of them were new to me: tamanu seed, nangai, maracuja seed oil… Eu2Be’s website does a good job running down how these different oils serve ya. The scent is subtle and a tad sweet (there’s some sandalwood, cedarwood & wild fig in there, y’all) – I love it. I’ve pretty much scrapped my use of all lotions in favor of body oil since discovering their splendor (where have you been all my life? ), but sometimes a body oil doesn’t quite do the trick on super-dry skin. So this is a great product to have around for the changing of the seasons. Hello, fall! This li’l sample tub reminded me of why I loved lotions for so long, and truthfully, I haven’t found too many lotions/body butters in the natural space that I love. Many are too greasy. So, big kudos to Eu2Be on this one. 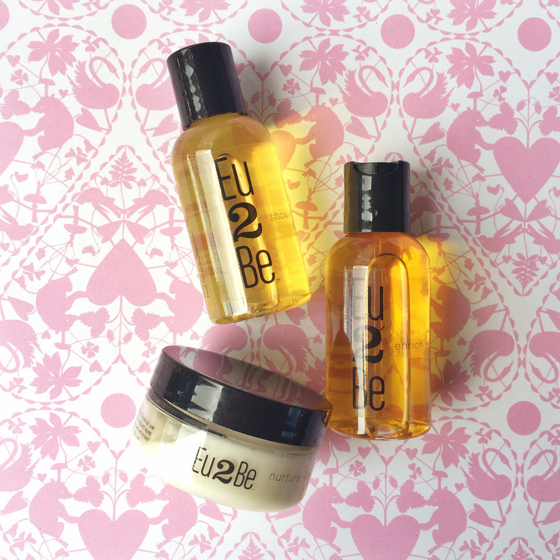 **All Eu2Be samples were generously sent to us for review by the product manufacturer. Check out our policy on product reviews.